Large Bricklin Dealer Signs Story. 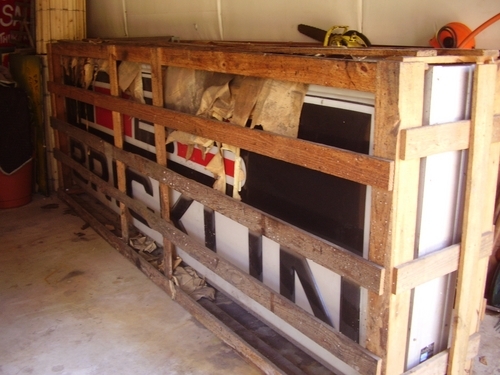 Many thanks to Kerry Stark for sharing this interesting story, and photos ! 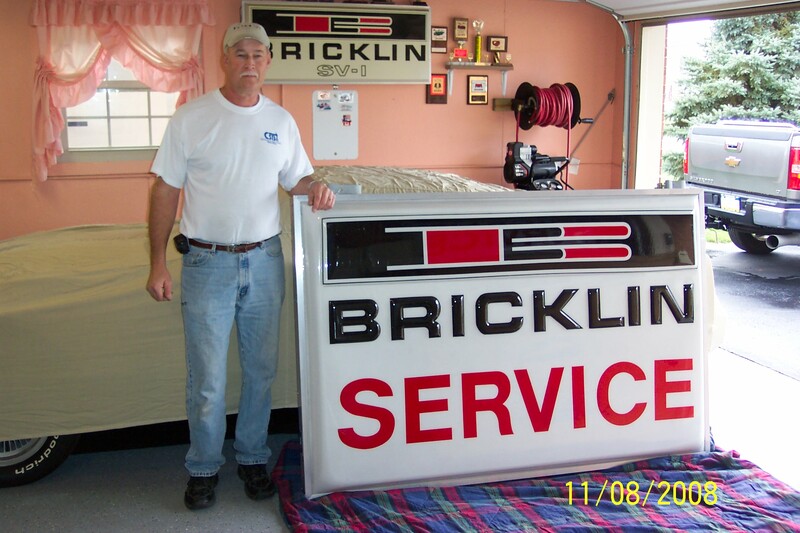 Back in the fall of 2008 I received a phone call from a Bricklin friend. 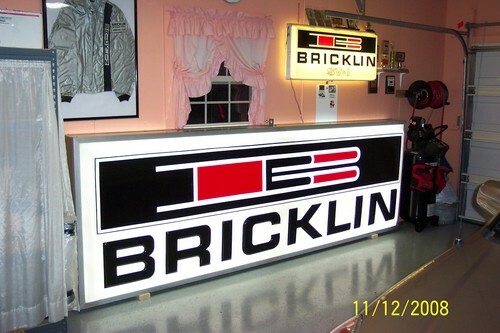 He had received a call from a woman in Buffalo, NY inquiring whether he would be interested in buying 2 Bricklin signs. 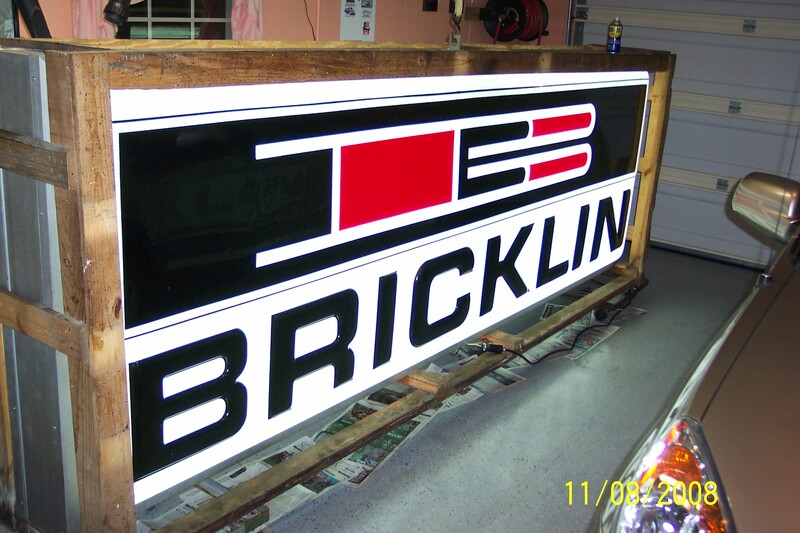 The Bricklin friend asked some more questions, thinking she was probably talking about the small 20"X 49" Bricklin wall signs that tend to be more common. She explained to him that the signs were much larger than that. After he realized that they were the larger dealership signs, he knew he was not interested since he had no place to display them. Subsequently he called me to see if I would be interested in them, as he knew I was a collector of Bricklin memorobilia. I made arrangements to go up to Buffalo and look at them. 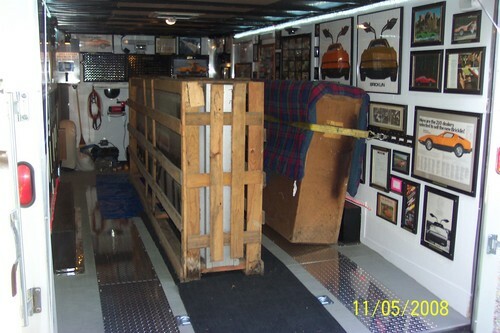 Since I figured that I would probably buy them, I took my enclosed car trailer along and drove to Buffalo, NY. I met with the widow, a very nice older woman. She told me the story that her deceased husband was an AMC dealer in Buffalo ( I am ashamed to say that I dont recall the name of the dealership), and that he decided to take on a Bricklin dealership in late 75. 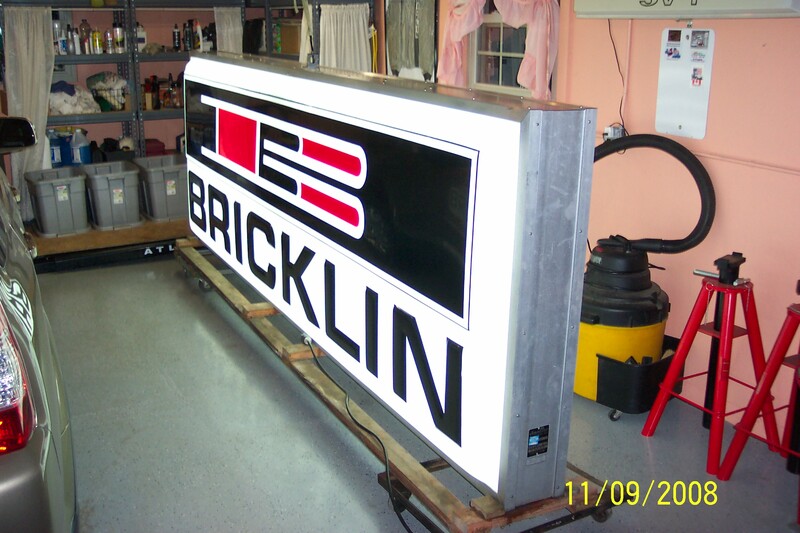 As a part of the dealer program, he purchased one of the 4' X 12" large dealership signs and a 4'X 6' service sign. When I arrived at her home, she took me out to a back garage. I was amazed to see that both signs were still in their original shipping containers. 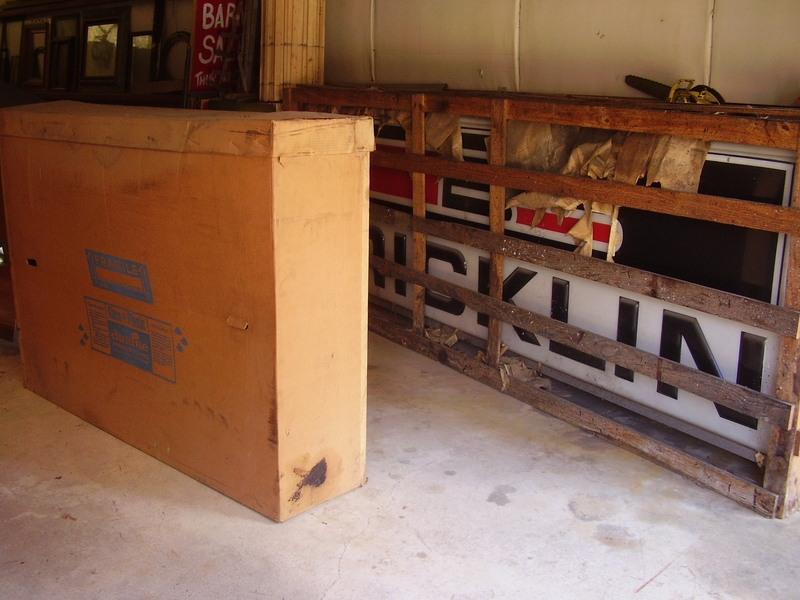 The service sign was in a large cardboard box and to my surprise the Bricklin sign was still in its original wooden shipping crate. Both of them were tucked back in along one of the garage walls and she told me they had been there for years. In fact, what happened 35 years earlier is that both signs arrived at the dealership but by the time they got there Bricklin Vehicle Corp had announced the closure of the plant and the ceasing of all production. Obviously at that point the dealership opted not to display the signs. As a result, they were either stored in a back room at the dealership or the owner's personal garage for the next 35 years. 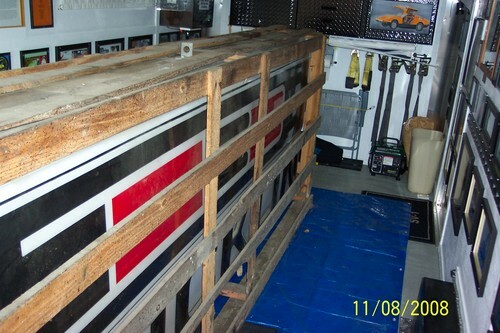 I bought both of the signs that day, loaded them into the trailer, and brought them home. It took me a few days to unpack them and get them cleaned up. Both of them still had the original bulbs inside that all worked perfectly when I plugged them in. 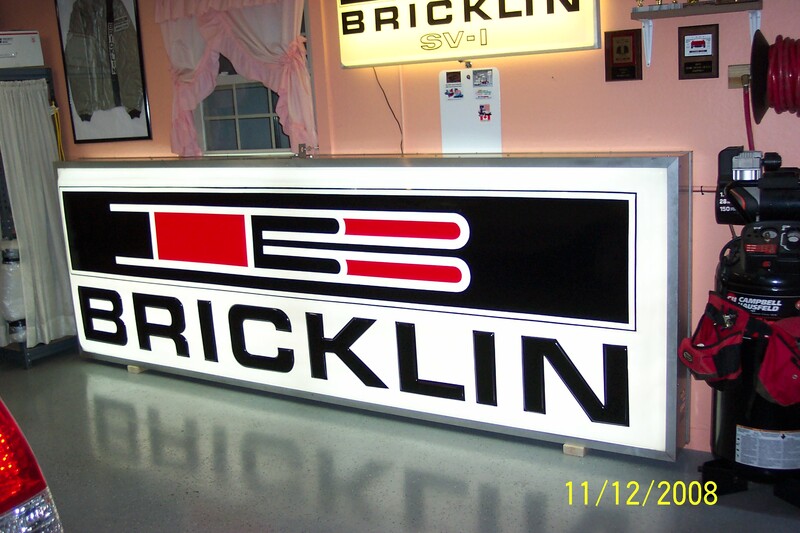 I have the Bricklin sign on display in my garage. I later sold the service sign to another Bricklin owner since I already had one of the 4"x6" service signs in my collection. 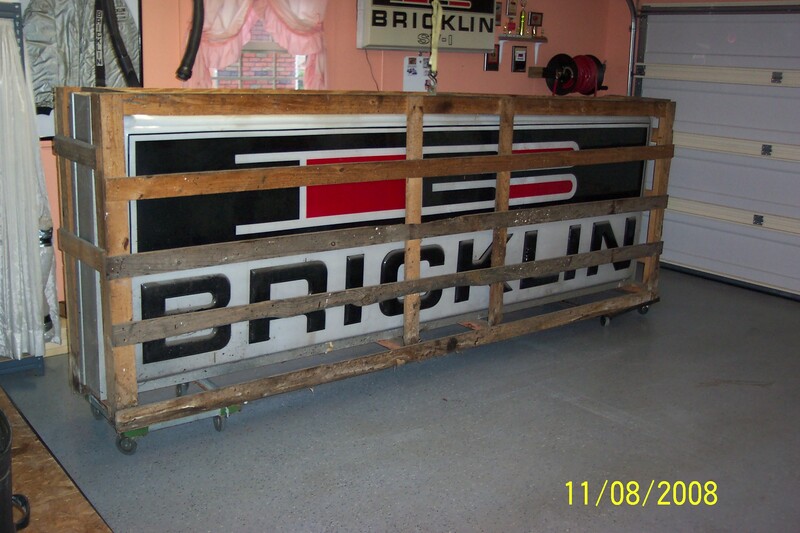 I felt good to be able to save 2 more pieces of Bricklin history. How the signs were found in Buffalo, New York. Larger Bricklin sign as found in its' original wooden shipping crate. Both signs loaded into Kerry's trailer in Buffalo, New York. 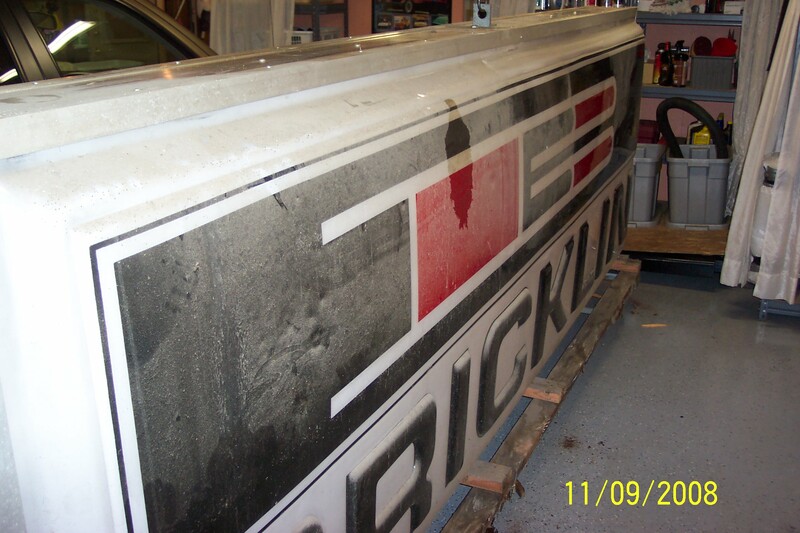 Side view of the larger Bricklin sign inside the trailer. The larger crated sign back home in Kerry's garage. Some of the crating has been removed and the sign is plugged in and lighted ! Crating removed, sign sits on the dolly carts and is lighted up ! Cleaned and finished, and on display in Kerry's garage. Large Bricklin Dealer Sign on display in Kerry's garage photo 2. Kerry and large Bricklin Service Sign finally out of the box after about 35 years !